An incredible new picture from NASA shows that the storm has a double eye wall. Hurricane Matthew is already a demonstrably unique storm, but NASA has captured an image of the hurricane that shows just how different it is than most storms: it has a double eye wall. The powerful hurricane is currently lashing the Florida coast, including NASA’s Kennedy Space Center, and the agency has been taking a close look at the storm. Matthew passed offshore of KSC near Orlando, and avoided a direct hit of the facility. NASA says there is some roof damage to KSC facilities, and there is scattered debris, but storm surge has been relatively minimal. The storm had dropped in strength, but was still much too dangerous for officials to inspect the damage. But it’s the new satellite views that have people talking about this storm. 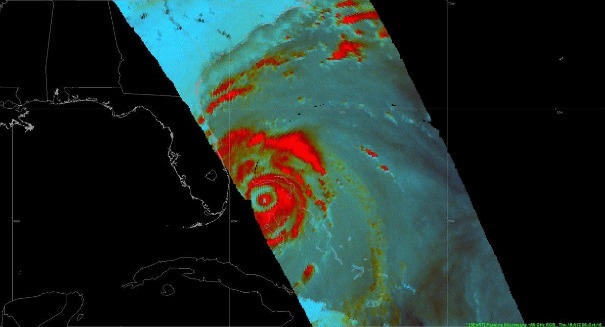 The images show a double eye wall, which only happens with very powerful hurricanes. Eye walls have the most intense thunderstorms and strongest winds and rains, and a second band means a double hammering for areas that have to experience it.